A Guide to Separating the Signal from the Noise in Material Handling Automation. Labor is becoming harder to find, more expensive and difficult to retain. 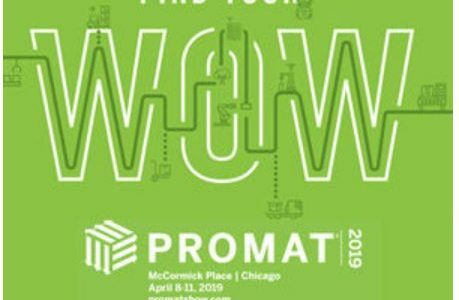 If this situation has you looking for piece picking automation solutions during your trip to ProMat this year, don’t be overwhelmed by all the shiny robotic objects on display at the McCormick Center. We have categorized picking automation offerings into six “evaluation buckets” that make it easier to focus your energy. The what: The simplest automation alternative is no automation! Simply having workers travel the warehouse and pick the product is a valid solution. The good: There is no technology investment cost. The bad: By definition this category is a labor-intensive way to address the use case. Pro guidance: This is not a viable, long term strategy if your goal is to have greater labor efficiency over time and/or address the current labor pressures. Next. The what: Simple technologies like put-walls, voice pick, RF pick and other add-ons can supplement the manual picking process that give some increased efficiency but don’t fundamentally change the pick process. 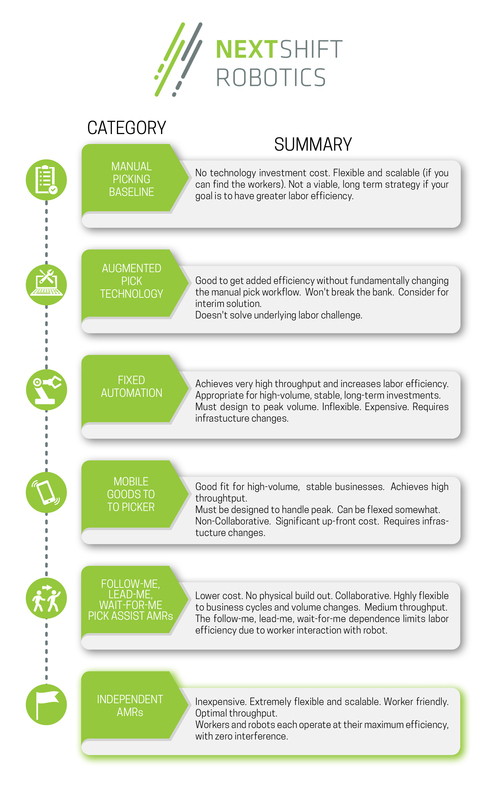 The good: These methods augment and automate parts of it for added efficiency at low to medium cost. The bad: They provide only a medium bump in throughput. Pro guidance: It’s not enough, folks. The what: Automation that is physically built into the facility, like conveyors, shuttle systems and ASRS. The good: A good fit for stable, high-volume use cases with little variability. The bad: High initial cost and effort of deployment. Invasive installation into the physical environment. With that upfront cost there is also an ongoing maintenance cost and the requirement to hold extra inventory. Most problematic for dynamic businesses will be a lack of flexibility. Businesses with seasonal volume or mix changes and dynamic business conditions will require more flexible solutions. Pro guidance: For appropriate use cases fixed automation achieves very high throughput and increases labor efficiency significantly, but is only appropriate for high-volume, stable, long-term investments. The good: Achieves high throughput and high labor efficiency for big businesses that can afford a hefty investment in both funds and time. The bad: Requires a build out with changes to the physical infrastructure and a potentially long and large deployment investment to get up and running. With these solutions there is also a requirement to hold more inventory to support the workflow. These are non-collaborative, meaning workers and automation cannot co-work in the same space. Pro guidance: Must be designed to handle peak fulfillment but can be flexed by adding robots, stations and personnel. Again, these systems are only a good fit for high-volume, very stable fulfillment requirements where very little flexibility is ever anticipated. The what: Collaborative autonomous mobile robots or mobile carts. The good: Newer robotic solutions are typically lower cost and do not require a physical build out. They assist the pickers and are highly flexible to business cycles and volume changes. Workers and robots coexist in the same physical space and pickers can operate ‘hands free’. The bad: The follow-me, lead-me, wait-wait-for-me dependence create a ceiling for the throughput and efficiency attainable and limits workflow flexibility – the workflow is constrained by the speed of the workers. Pro guidance: These solutions are a good first step in robotic automation but have a built-in ceiling on the labor efficiencies they can achieve because they are constrained by the speed of the worker. The what: Next generation technology. Robots work collaboratively but independently from workers in the warehouse. The good: Robots run collaboratively in the same space as the workers—but workers are not forced to interact with the robots at all. Removing this constraint enables a much higher throughput. The bad: A picking application is required and the workers are not entirely hands free. The better: Independent AMRs tick every box in the robotics advantages checklist. Inexpensive. Extremely flexible and scalable. Worker friendly. Optimal throughput. Pro guidance: Years of materials handling automation has been building to this approach, where workers and robots each operate at their maximum efficiency, with zero interference. We hope this guide helps you to narrow your search so you can focus in on the best technology solution for your fulfillment operations—and your business bottom line. LOWELL, MA — February 21, 2019 — NextShift Robotics, a provider of autonomous mobile robot solutions for automated order fulfillment and warehouse materials management, will be demonstrating its unique No Following / No Waiting robotic workflow solution in Booth S4675 at ProMat 2019, to be held April 8-11, 2019 at Chicago’s McCormick Place. 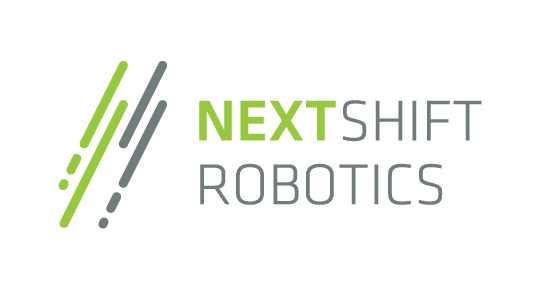 NextShift will demonstrate a fundamentally different autonomous mobile robot workflow for material handling. The unique value of the NextShift solution is based on robots that can load and unload containers autonomously. 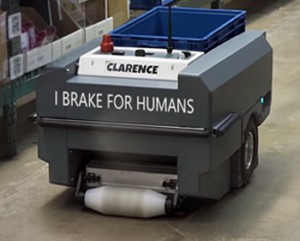 This breakthrough capability allows workers, materials and robots to be treated completely independently within a highly flexible materials handling workflow. NextShift exploits the independence to achieve significantly higher warehouse throughput and dramatic process-based cost savings. ProMat 2019 registrants can pre-schedule an appointment to see a demonstration of NextShift’s innovative No Leading, Following or Waiting robotic materials handling system. ProMat is the leading conference and exhibition for manufacturing, distribution and supply chain equipment and systems. ProMat provides a showcase for powerful solutions and innovations the industry. ProMat features over 950 solution providers offering the latest technologies driving productivity improvements. There will be over 100 show floor seminars, including town-hall-style sessions on autonomous vehicles and sustainable facility solutions. NextShift Robotics designs and manufactures collaborative, autonomous, mobile robotic systems that increase productivity in manufacturing and distribution centers. 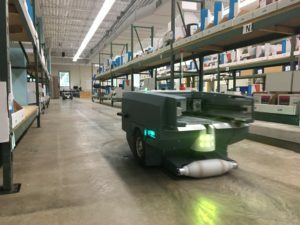 Founded to revolutionize material handling for e-retailers, 3PLs, OEMs, manufacturers, and brick and mortar businesses, NextShift autonomous robots work with, but independently from, warehouse staff to optimize the fulfillment process by increasing labor efficiency, order velocity, and warehouse capacity utilization. Visit www.nextshiftrobotics.com. Hy-Tek Material Handling, Inc. is the premier single-source provider of material handling solutions for a wide range of industries. Since 1963, Hy-Tek and its best-in-class industry partners have been providing customers large and small with turnkey solutions. Headquartered in Columbus, Ohio, Hy-Tek serves customers in the United States, Canada, and Mexico from offices in Georgia, Kentucky, Ohio, New Jersey, Pennsylvania, and Tennessee. Visit www.hy-tek.com. Lowell Massachusetts, 12-10-2018, NextShift Robotics, a provider of fundamentally different robotic workflows for material handling in distribution and manufacturing recently demonstrated the ability of its robots to climb 8+ degree ramps. A real-world robustness has been designed into NextShift robots with the understanding that the surfaces aren’t always flat and pristine. This is an invaluable differentiator when dealing with the realities of logistics. Why is that important? 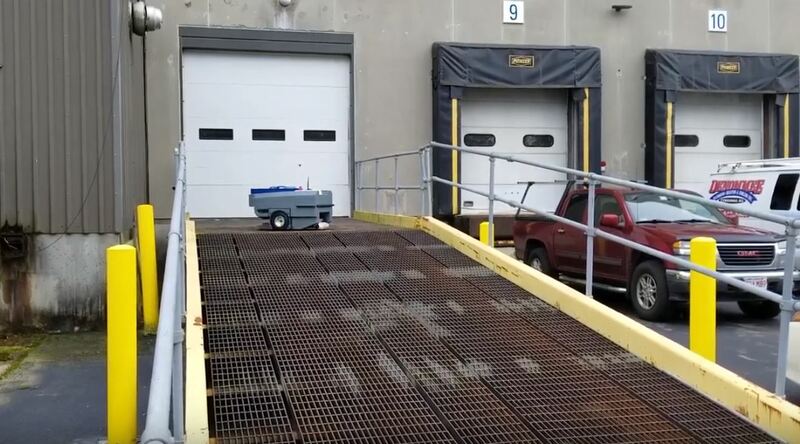 Because in many cases material handling workflows must move between buildings or onto mezzanines with open grating. Unless you have a robot that is designed to handle these surfaces and inclines you won’t be able to support your workflow. Often people don’t discover this limitation in their robots until they run into it in their facility. Robots without this ability will simply stop, essentially getting stuck in the facility until someone comes to rescue them. Having to rescue stuck robots runs counter to the value proposition of ‘robotic automation’. Next Shift robots don’t get stuck. NextShift robots are built for the real world of logistics and manufacturing. We asked a cross-section of industry influencers, practitioners and executives the question: “What are the barriers to adopting Autonomous Robotic workflows in fulfillment?” and got some fascinating answers. That input helped us create a white paper titled The Amazon Effect & Robotics Adoption in Fulfillment that reveals five perceived barriers that may be keeping you from revolutionizing your fulfillment operations using autonomous mobile robots, along with some insider recommendations on how to mitigate those barriers. It often takes influential “first movers” to demonstrate the real results that get the rest of the industry going. Of course, distribution centers have been adopting automation and robotics since the invention of the assembly line. Our research shows that a good first step step is to initiate small scale AMR deployments that demonstrate efficacy, then scale up. Happily, AMRs are extremely cost-effective and easy to add incrementally. They can be rolled out with very little impact on existing infrastructure. Companies may start with a small product category or a selected area of the warehouse then scale by phasing in more robots. What we found was implementing an AMR solution does not trigger expensive infrastructure reconfigurations, physical plant remodeling, worker retraining, and system integration fees. Instead, labor efficiency drives ROIs that can be measured in months, not years. The cost of AMR is a fraction of the cost of alternative approaches such as, conveyors, and fixed automation. Robots and pickers can work side by side, allowing existing (brown-field) DCs to be quickly and easily retrofitted with no disruption in daily output. The DC can keep fulfilling the core business as AMRs are added, something not possible with conveyor or other fixed automation conversions. Our conversations revealed that initially, vendors provided robot hardware that required extensive custom software programming to integrate with existing warehouse and order management systems. But today’s next-generation AMR technology optimizes the entire workflow by managing orders, workers and robots independently for the highest level of benefit. Because of advances in the maturity of the solutions, today’s robust, mature, comprehensive software-hardware systems integrate more easily with base systems, are easier to administer, and manage. Our interviews revealed that some warehouse and fulfillment teams fear that their existing systems will have to be modified to meet the robots’ requirements. This is an understandable fear, but today’s robotic solutions come coupled with a mature software system. The WMS (or equivalent) sends orders and the robotic system sends back completions. To the WMS, the AMR software is just another picker to send orders to, and that picker sends a notification back when the product has been picked. In our experience, AMR technology is a major job satisfaction improver that dramatically reduces stress and physical strain on workers, while raising accuracy. This leads directly to better worker retention. For some, there is a perception that employees and management are predisposed not to embrace robotics as a worker-friendly productivity booster. The managers we spoke to praise robotic workflows as a way to retain core workers while relying less on temporary and flex help. Reducing touches and the human mistake rates that are inherent to manual systems results in higher productivity, process quality, and fewer unhappy customers. Win-win. In an era dominated by growing ecommerce demands and shortages of labor, workflows must be transformed. The more execs we talk to, the more we find who consider autonomous mobile robots to be the most significant replenishment power-up available to warehouse teams today. When robots work completely untethered from workers and are independent from the orders being picked, each element can be scheduled and optimized specifically. This is only possible with robots that can pick up and place containers without any worker intervention. We’ve found that the most common barriers to AMR adoption are largely based on misperceptions that are easily swept aside. Early adopters are finding out how little real risk is involved in adopting game-changing AMR automation. For more about overcoming these five “barriers,” read our whitepaper.